It has been said that if you put three Scotsmen together for long enough they’ll form a bank, if you put three Welshmen together they’ll form a choir and if you put three Englishmen together, they’ll form a queue. Waiting can be seen as a national characteristic, but despite this fact it isn’t something that people like to do. We, all of us, often do it rather reluctantly, grudgingly, and if the truth were told we’d rather not be doing it at all. Nonetheless, this is what we are called to do, living as we do between the Resurrection and the Second Coming. We are called as Christians to wait. To wait for the Second Coming, to wait for the End of the World. This idea may well conjure up images of people with a strange expression, wearing sandwich boards proclaiming to all and sundry that the End of the World is nigh! But, at one level, this is what the season of Advent is all about – we are to prepare for the coming of our Lord and Saviour Jesus Christ, both in the yearly memorial of His Incarnation, and for His second coming as Lord, Saviour and Judge of All. 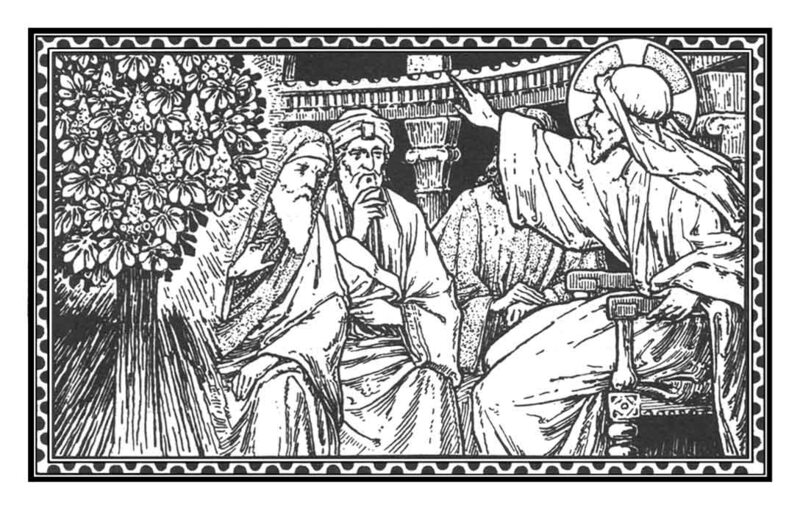 The injunctions in today’s Gospel to pray, to fast and be alert, are how we, as Christians should prepare ourselves to meet Jesus both at Christmas and whenever the Second Coming may be. If we consider the parable in today’s Gospel, the parable of the Fig Tree, two things are apparent, firstly fig trees are clearly visible and easily recognisable in the Middle Eastern Landscape – when Our Lord comes it will be apparent to all and sundry. Secondly, figs, as fruit take a long time to ripen, so as their visibility shows us that the Kingdom of God is close at hand, their long ripening shows us that we need to be prepared to wait, for all things will happen at their appointed time, a time which even the Son Himself does not know. In the meantime we need to guard against Drunkenness and Hangovers (not those caused by the inevitable Christmas party) but the metaphorical kind – a lack of alertness, a sluggishness with regard to the Gospel, and an excessive concern with the worries of this life, instead we need be alert and watchful which will allow us to ‘stand tall when others faint’. 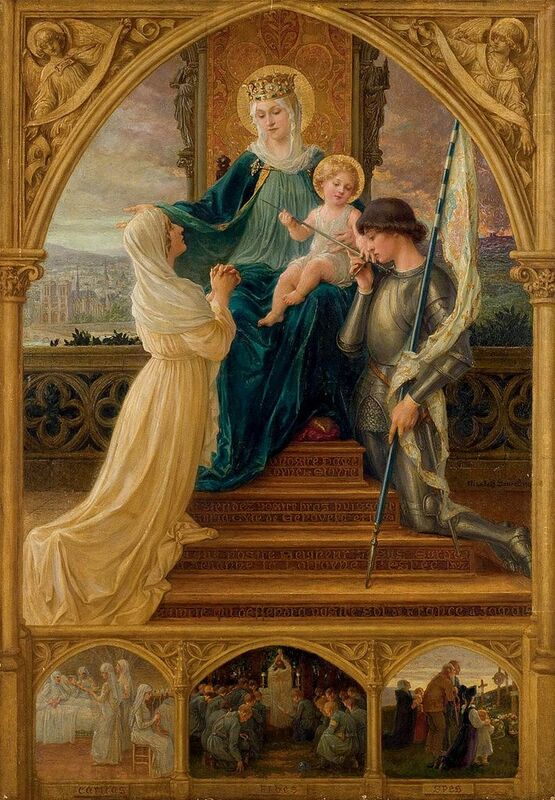 God has made a promise, through the mouth of His prophet, Jeremiah, a promise of salvation and safety, which is brought about through the Blessed Virgin Mary’s ‘Yes’ to God, which will lead to the Incarnation and thereby the Salvation of the whole world wrought upon the altar of the Cross. It is this faithful and loving God whom we wait for, a merciful judge. Thus, Advent, the preparation for the coming of Jesus as new-born infant and Judge is a time of hope and joy. We can like the Apostle Paul in his letter to the Church in Thessalonica be filled with joy for the Lord, resolute in our prayer for and encouragement of one another as a Christian family. This prayer and encouragement leads to an increase of love for both God and our neighbour. This is what living the Christian life means, something we do all through the week, not merely for an hour in church on a Sunday morning. This is the preparation we, as Christians, need. It is something which we cannot do on our own; we need to do it together, encouraging one another to live lives filled with the love which comes from God, which is God’s very nature as a Trinity of persons. This love and a freedom from the cares of this world is what Jesus comes to bring us, this is our deliverance, our liberation from sin. It is this love and freedom which makes God give himself to us this morning under the outward forms of Bread and Wine. What greater present could we offer to the Infant Jesus than hearts filled with love and lives lived in the true freedom proclaimed by the Gospel. Thus, at one level it doesn’t matter whether the Second Coming is today or in a million years time, what matters is living lives infused with the values of the Kingdom of God, a joyful and yet a serious business. We know what we should be doing, and this is something we as Christians need to do together, praying for the Grace of God to help us, to strengthen us and fill us with that Love which comes from Him. We may feel unsure, unsafe, and worried but relying on God as part of His family, the Church, we can take courage and be alert to take part in that great adventure which is the Kingdom of God. We, all of us, have a fairly well defined idea of kingship in our heads: from the benevolent saintliness of Edward the Confessor, to the tyrannical corpulent Henry VIII. Human kingship can be something of a mixed bag: depending upon an accident of birth, and sadly while one may have power, without the knowledge and humility to use it well and in the service of others. Thus, we would seriously err were we to extrapolate divine kinship from its flawed human counterpart. If I were to ask you the question, ‘what does a king look like?’, you may well reply that he wears a crown of gold, and a cloak of red or purple velvet. He looks impressive and dignified; everything about him makes you go ‘Wow!’ It’s quite understandable – it’s how we expect a king to look, it’s what we’ve grown up to expect: whenever we see pictures of kings they look like this. In this morning’s gospel we are given an entirely different picture of kingship. Our Lord will soon receive the outward trappings and will be hailed as a King. And in the mockery people will not realise that the joke is really on them. Christ is truly a King, but not in a way that the world can easily understand. His kingdom is not of this world; the way of God is not to use threats, mockery, or violence. Instead, Christ becomes incarnate, becomes a human being, to bear witness to the truth. He who is the way, the truth, and the life, comes that we might know the truth and that the truth might set us free. As those who follow him, we as Christians are to be free, to stand against this world and its power, to show it another way: where weakness can triumph in the face of anger, where love can overcome bitterness. The world around us cannot understand this, it could not at the time of our Lord’s passion, and it cannot even today. One needs to experience it before one can begin to understand it. Christ shows the world his reign of glory by being nailed to a cross and now exalted in glory and coming to be our judge he bears in his body the wounds of nail and spear, the wounds of love, wounds which heal and reconcile humanity. In his dealings with Pilate, Christ foreshadows the church and its dealings with secular power. Just as Pilate could not wait for an answer, so the world around us can only treat the church with impatience and contempt: neither then nor now can we hope to be understood, we are instead to be threatened to capitulate to a secular power – for the Romans and their power, read the whim of politicians and the tyranny of so-called ‘equality legislation’. As the body of Christ, we exist to love and to serve God and one another, and call the world to repent and to believe and to be healed by God. We have bishops to be our Chief shepherds, as successors of the apostles, those called and set apart by Christ to be shepherds and not hirelings, laying down their lives like Christ and for Christ, and not solely to sit in the High Court of Parliament. We then may advise the state, for its own good, but primarily so that the church may continue to preach the gospel and make disciples of this nation and every nation. The world may not understand us, it may not listen to us, or like whom we are and what we do or do not do on, but we cannot allow ourselves to be conformed to the world and its ways. In loving and serving God we call the world to conform itself to his will. Only then can we bring about that radical transformation envisaged in the Gospels: living as a community of love and not fear. It is through living it out in our lives and as the church that we can show the world a better way of being, a way which acknowledges Jesus Christ as King of all the universe, where his way of love washes away our sins with his blood, reconciles us to God and each other, and forgiving others as we ourselves are forgiven. Where the world wants blame we have to live out the love and forgiveness, which we ourselves have received from God in Christ Jesus. This then can truly be a kingdom and not of this world. So as we prepare to enter the season of Advent, where we will prepare ourselves to greet the King of the Universe born in a stable in Bethlehem, let us acknowledge Christ as our King, whose Sacred Heart burns with love for us, whose wounds still pour out that love upon the world, and let us live as people loved, healed, restored and forgiven, that the world may believe and all creation acknowledge God the Father, God the Son, and God the Holy Spirit, to whom be ascribed as is most right and just, all might, majesty, glory, dominion, and power, now and forever. When faced with an example of evil, of horror, human sinfulness on a grand scale it can be hard to know exactly what to say and do, as terror has the ability to paralyse us. It may not seem much but we can pray and trust God, and in His love and mercy. Compared to this all the sin and hate and bitterness of the world melts away. When Jesus talks to his disciples on the Mount of Olives, he speaks of a future which is uncertain and unpleasant, a future which we inhabit. And yet in this uncertain future we can be absolutely certain of one thing: namely that we are loved by God, as this is demonstrated by Our Lord and Saviour Jesus Christ on the Cross, where he carries the burden of our sins, past present and future, each and every act of murderous terrorism, all the sin which separates us from each other and from God. It is this confidence which inspires the author of the Letter to the Hebrews – he knows and trusts in the love of God shown to the world in Christ Jesus, to heal and restore humanity. There may be times when we don’t feel this to be true, when faced with an unrelenting torrent of human misery that we fall into despair. We want God to act, to sort things out, and yet, he already has, that is the point of Calvary, it is the place where human sin and Divine Love and Forgiveness meet, and where death is swallowed up in the victory of the Resurrection. We get upset if God doesn’t act in the manner or time of our choosing, while forgetting that He already has, once and for all. We can rest assured that in the end Love will win, it has fewer guns and bombs, but more friends, and as Christians we know that Divine Love has a human face, a human heart, who says of those crucifying Him ‘Father. forgive them, for they know not what they do.’ Even as he dies, in pain and agony, in naked humiliation, his thoughts are for those whom he loves, whom he came to save. This is something to cling to, someone in whom we can put our trust. This is why, day by day day and week by week, for nearly two thousand years the church does this in memory of Him, so that we are mindful of the fact the Christ as both priest and victim offers himself upon the altar of the Cross to take away our sins, and we come to be fed by Christ and with Christ, with His Body and His Blood, so that we may be healed and restored, given a taste here on earth of the glory which awaits those who truly love and follow him. 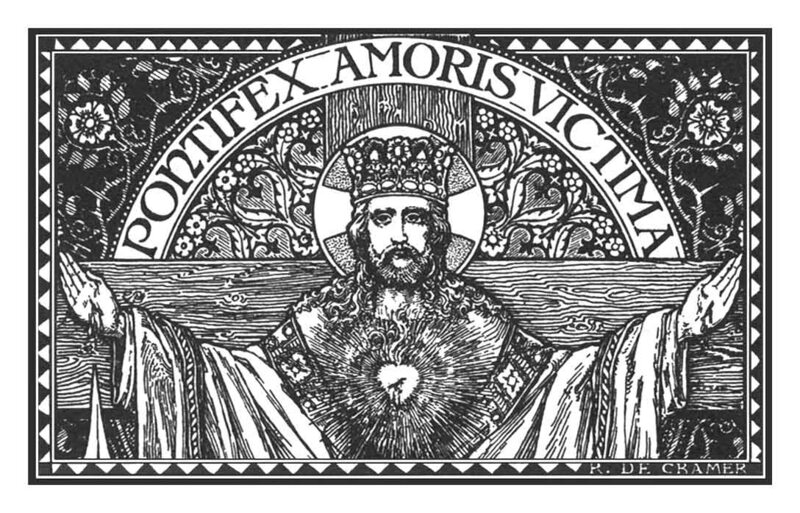 This why we are here today, because we know that death, and sin, and hatred, and fear could not overcome Divine Love: Our Lord rose on the first day of the week, victorious over sin and death. We are an Easter people and ‘Alleluia’ is our song. WE know that nothing, not even death itself can separate us from the love of God in Christ Jesus, and we can put our trust in Him. We can be fed by Him, and with Him, so that we can share in that life of divine love here and now, so that He may transform our human nature, giving us a pledge of immortality here and now to strengthen us, to restore us, to heal our wounds, and fill us with His Love. His victory is complete and total, its effects extend through time, it is eternal, the Love of God can change our lives, if we let it. So, let us come to Him to be transformed, and filled with His Love, strengthen to proclaim the Good News of the Kingdom so that all may repent and believe, and give Glory to the Father, and the Son, and the Holy Spirit, to whom be ascribed as is most right and just, all might, majesty, glory, dominion and power, now and forever.